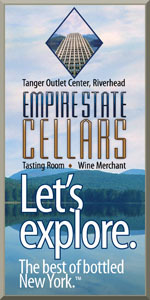 "This was April 23rd at Freedom Run Winery. 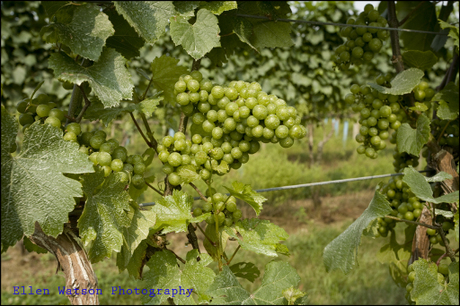 This is a pinot noir vine planted in their Stonehaus Vineyard on Lower Mountain Road in Lockport, NY. 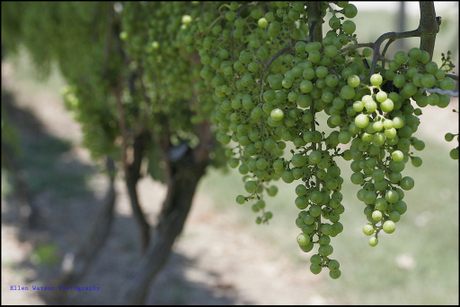 This vineyard heats up faster due to its relatively flat topography compared to its higher elevation vineyards." This picture definitely shows full-on bud break -- but only in wild vines that associate winemaker Peter Becraft says "grow everywhere" around Anthony Road and are probably vitis riparia. 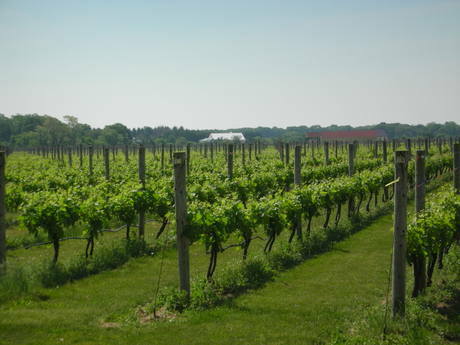 Jared Skolnick of Vine Views and Grand Cru Classes sent this picture from his nine-row educational vineyard in Mattituck. "We are cold stabilizing a tank of red, which is pretty easy to do when it is 18 degrees and colder outside. This particular tank always tends to drip small drops from the manhole seal when the temp gets down there. What you are seeing is a slow accumulation of drips over a couple of chilly days and nights. No need for alarm." And if you're curious, that's Tony's Red, a semi-sweet red made mostly of Rougeon. 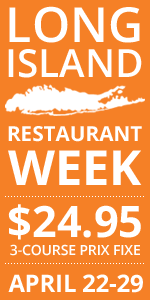 "I went by the vineyard on Saturday of Labor Day weekend. 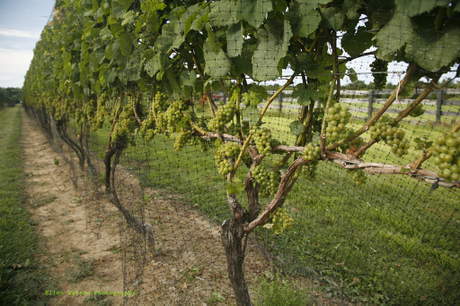 There is now wire fencing around all of the grapes that I have been documenting....heavy wire fencing that either needed to be opened up or crawled underneath. I did not want to do either one of these things without first speaking to Christopher or Allison. However, it was really busy with lots of weekend visitors and I did not want to bother the staff with my questions while they were busy selling wine! So, I left and emailed Allison about getting inside the fencing. She said it was ok to go inside, as long as I was very careful about it. I went back a few days later and crawled inside. No easy task with a tripod, camera, camera bag, etc. However, I managed it and am I glad I did. All of the grapes look very luscious at this point. They are plump and juicy looking. The Pinot Grigio grapes are now the “root beer” color that I was told they would eventually be. Once again, it was a really stunning day when I was there. Every time I go to Channing Daughters, I am struck by the silence on the property. The property is really big, and it is far enough off the road, that the only real noise you can hear is the drone of a plane overhead once in a while." From the photographer, Ellen Watson: "Nestled into the leaves on abundant vines, these pinot grigio grapes look like a lush, Dutch still life painting, at Channing Daughters Winery in Bridgehampton, NY." 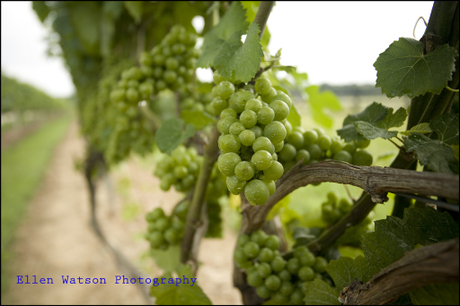 From the photographer, Ellen Watson: "Appearing to defy gravity, these robust Chardonnay grapes are growing heartily at Channing Daughters Winery in Bridgehampton, NY." As I mentioned last week, Ellen will be visiting Channing Daughters weekly to follow three bunches of three varieties (merlot, chardonnay and pinot grigio) throughout their lifecycle. Instead of putting all three picture into a single post each week, I'm going to space them out a bit, starting with the merlot this week. From Ellen: "An overflow of Merlot grapes, cascading off the vines on a summer afternoon, at Channing Daughters Winery in Bridgehampton, NY." 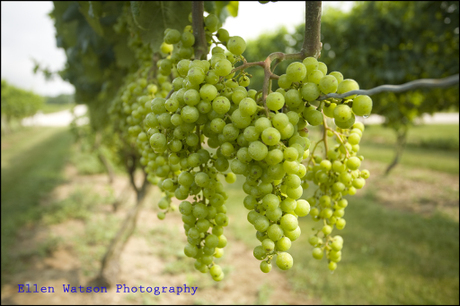 You might remember that last year, Ellen Watson, the East Hampton photographer who serves as the resident photographer for LENNDEVOURS, took a series of pictures at Wolffer Estate Vineyard. 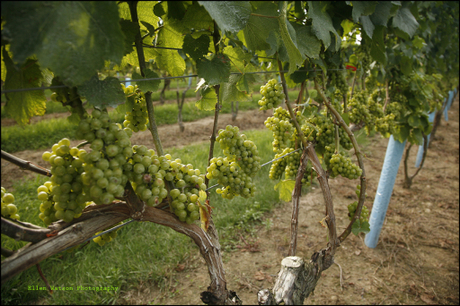 In the series, she chronicled a two specific rows of chardonnay as they changed throughout the seasons. The series is available online. This year, Ellen will be taking on a slightly different project for LENNDEVOURS at Channing Daughters Winery in Bridgehampton. Rather than following the evolution of two rows, she'll be following the changes that three clusters of three different grape varieties make throughout the growing season. Specifically, she has identified a cluster of merlot, a cluster of pinot grigio and a cluster of chardonnay that she'll be photographing. 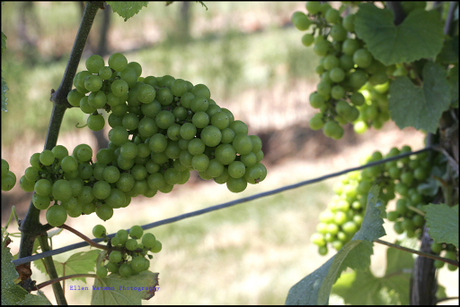 "Similar to the Wolffer study of rows 18 & 19, this will be a study of one cluster of grapes over the growing season. Then, Christopher Tracy (the winemaker) came out to show me around, and suggested photographing three varieties of grapes, because as the grapes mature, their appearance gets quite different from each other. We chose merlot, pinot grigio and chardonnay. 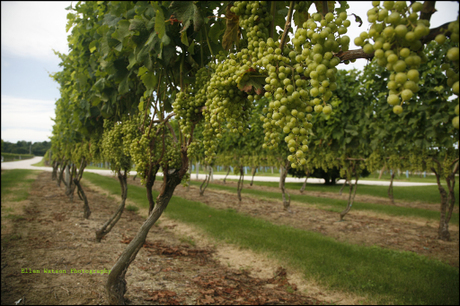 At this point, the grapes are all very small and a yellow-green color. Upon arrival, I was also happily reminded by the posted signs, that Channing Daughters is part of the Peconic Land Trust. I went to Channing Daughters for my first visit on July 10th. This day should go down in history as one of the loveliest Summer days ever. The temperature was in the mid-70’s, the sky was a perfect blue with gorgeous cirrus clouds and there was a breeze that was heavenly. It could not have been more perfect. In fact, I said to Chris that it would be a great day to lay down in the grass and take a nap! The day reminded me of being a kid and doing something carefree like that. There was a hush over the acres of vineyards; the only real sound I could make out was the breeze blowing thru the vines (you can see them blowing in some of the photos) and once in a while, the far away drone of a plane overhead. I could not even hear the traffic on the road. 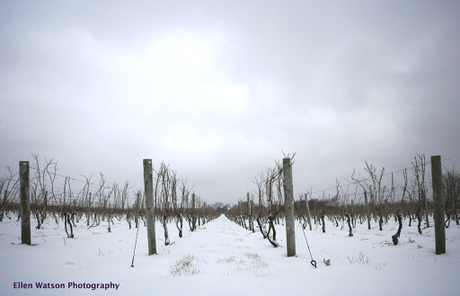 Having arrived at Channing Daughters with the idea of shooting landscapes in mind, I did not have my macro lens with me for close-ups of the grape clusters. 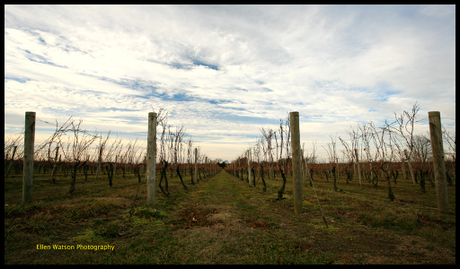 So, I decided to shoot the front of each of the rows that I will be documenting. These images are intended to give you a sense of place." 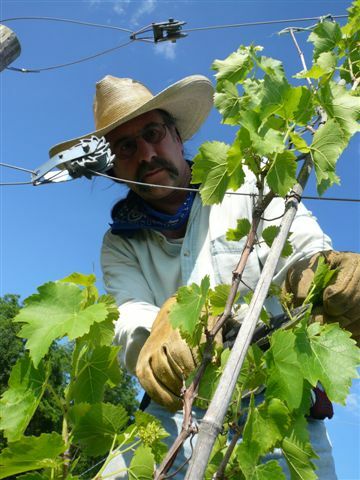 This edition of Vineyard Visuals features John Zuccarino from Silver Springs Winery doing a little work in the vineyard. 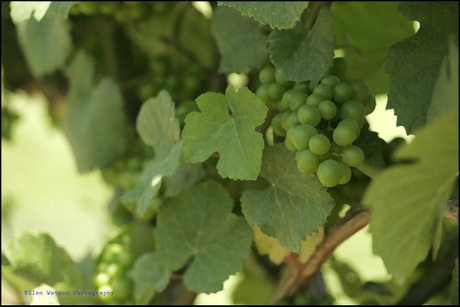 It's been a little while since our resident photographer, Ellen Watson, sent a photo update of our little block of Wolffer Estate chardonnay. We've had a lot of dreary weather when Ellen was out that way, and as you can see, we still haven't had any snow that is sticking long. 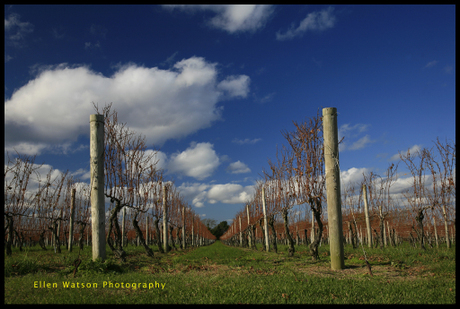 There is something about vineyards this time of year that I find so appealing. I actually think I find them more attractive now than when they are lush and over-flowing with green and grapes. Maybe it's the fact that they are sleeping now, preparing to bring us great wines again next year. As always, this picture has been added to our Flickr slideshow. "Yesterday was a gorgeous day. It was bitter cold. I got to Wolffer and noticed that all of the leaves are off of the vines. 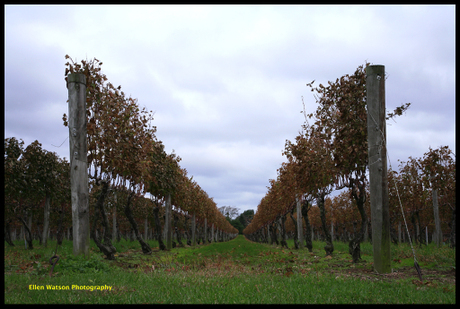 The color of the vines is a red brown....the clouds and sky were spectacular....the ground was cold and damp as I lay on my belly. I prayed that I could hold the camera still as the wind blew over me @ 3:30 in the afternoon." Ellen and I will continue this project through the winter as well, so I think we'll see some more great pictures. Fall is definitely upon us as you can see in the leaves of this picture, taken on November 11.